A young couple from New York City with two kids in grade school made the move to Vermont! They found a lovely house with a great barn and amazing views of the green mountains. The house needed some work and we were brought on board to help. The home is an L-shaped design, built in the 1800’s with an addition built in the 1960’s. The older part of the house is spacious, has a nice flow and takes advantage of the great views. 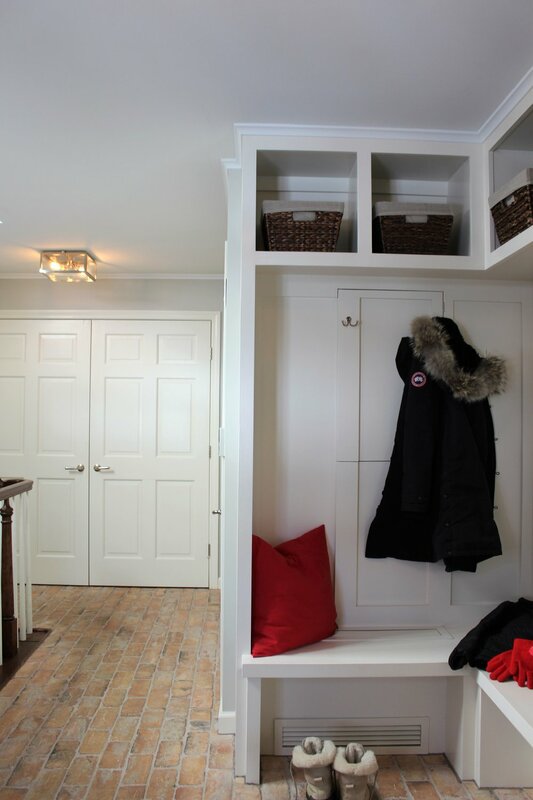 The addition consists of a three car garage, mudroom and 3 bedrooms. To make this home comfortable for the new owners we painted the walls, added new carpet, window treatments and updated all the bathrooms. One of our favorite rooms to design was the downstairs powder room. On the walls, a beautiful grey textural grass cloth by Philip Jeffries was added above white wainscot panels. On the floor, we added blue stone tiles in a smaller format than the ones in the foyer adding continuity to the flow. The project photos reflect an atmosphere of reserved simplicity, elegance and beauty.